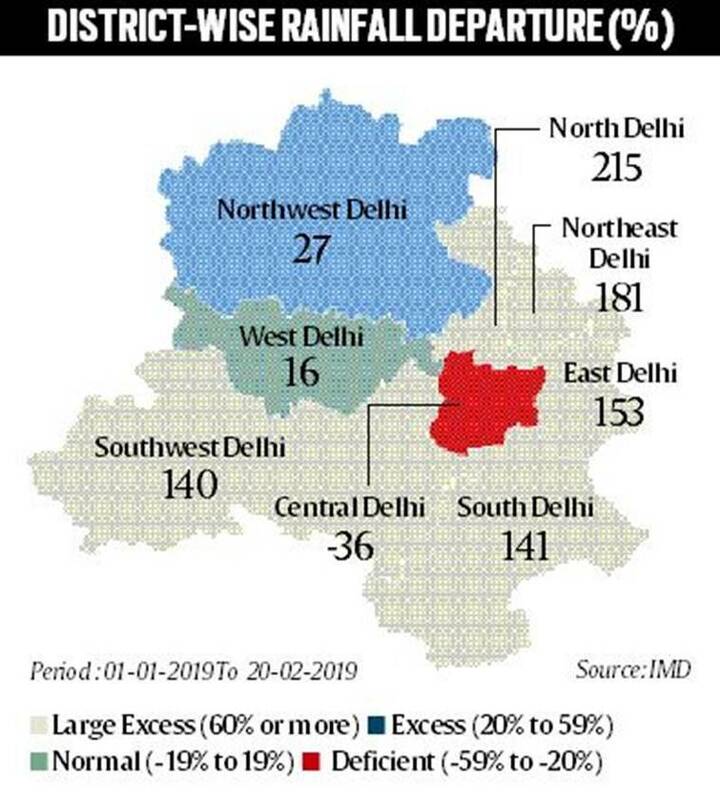 The only area in Delhi which has seen a rain deficit is Central Delhi. IMD’s dedicated rainfall portal shows that in the months of January and February (till 20th), Delhi received 98% surplus rain. A series of western disturbances in the city has, so far, made this February the wettest since 2014. According to data available with the India Meteorological Department (IMD), northwest India has seen six western disturbances this month already, which is unusually high. Delhi has already received 22.9 mm of rainfall till February 20, against the normal of 15.1mm that is usually seen in the whole month. According to IMD officials, one more western disturbance is expected to bring more rain to the city in the last week of February. At 215% more rain than usual, North Delhi received the highest rainfall in the city. This was followed by Northeast Delhi, with a 181% surplus. The situation is similar in six out of the nine states/UTs that form the Northwestern region. For the two months, only Rajasthan, Chandigarh and Haryana saw rain deficit, ranging from 17% (Rajasthan) to 6% (Haryana). According to officials at IMD, Delhi is expected to see light rain and thundershowers on Thursday. Strong surface winds and hail is also expected in a few parts of NCR. Saturday will be quite eventless, with the IMD predicting only shallow fog. The weather is expected to remain the same on Sunday as well. Meanwhile, Monday and Tuesday are expected to see rain and thundershowers, the forecast said.